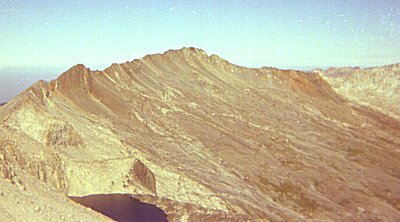 In 1976, I had intended to climb Triple Divide Peak, but had backed out on the Coppermine Pass route. (See separate description.) My objective this time was to make it up the peak. After that, I wanted to climb Mt. Brewer and return via Deadman Canyon and Elizabeth Pass. I decided to fly to Fresno, and to catch the bus to the park. This was cheaper, faster, and would allow my wife to have the car while I was away. 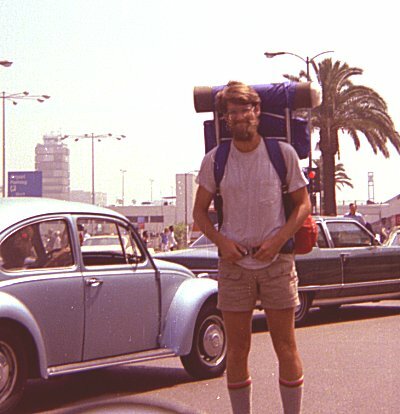 The adventure started at Fresno Airport, where I flew in. 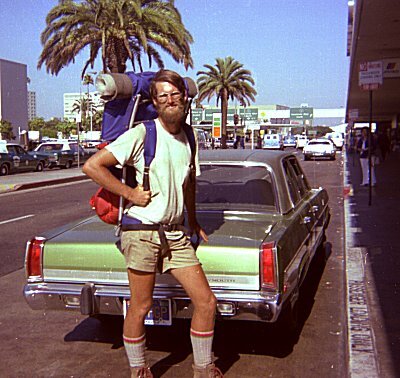 I was waiting on the curb for the bus to Lodgepole, in the August heat. An elderly couple was headed in from the parking lot, when the woman collapsed a couple feet away from me. She hit her head on the curb, and blood started gushing everywhere. The man seemed flustered, so I reached down and covered the gash in her forehead with my hand, slowing the flow of blood. The other people around seemed to go on with their business, while the man disappeared inside. After a while, the skycap appeared with some paper towels. When I moved my hand, blood started flowing again. The woman seemed barely conscious. It seems like we sat there on the ground for half an hour before the paramedics came, just as the bus was pulling up. I quickly rinsed the blood off my hands and arms and dashed for the bus. One other thing on my mind: when I checked in my backpack in LAX, they had demanded to know if I was carrying gas. I had no idea that I would not be able to fly with it. I had to dump it out in the airport sink. Now I was worried about where I could replace it. I was hoping that I could buy just enough to fill my tank, but no one would sll me less than a full gallon. I filled my stove and asked the clear to give the rest to the next backpacked who asked for some. They looked at me like I was crazy. I was beginning to come to grips with the difficulties posed by flying in. The weather was perfect, clear and warm. I made faster progress than last year, passing Pear Lake before lunch time. I had to do less hunting around for the route, and recognized many of the landmarks from last year. The sun was blazing hot, and I chased grasshoppers up the slope. I reached the Moose Lake overlook in early afternoon, and spotted a party camped on the shore of Moose Lake. I continued along the ridge, descending at the far end of the lake. I stopped to cook dinner, then packed up and hiked on another few miles. I kept going toward Elizabeth Pass. This was much better than detouring around by Big Bird Lake. I hurried along, reaching Deadman Conyon by lunch time. I made good progress through Coppermine Pass. I reached the pass into Cloud Canyon in the late afternoon, and met a couple hikers on their way up. They gave me some hints about the route to the canyon floor. 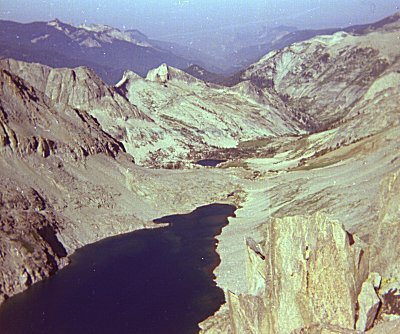 I again studied Triple Divide Peak and Glacier Lake, and then set off toward the lake. From across the canyon, it was not clear if I could make my way just beneath the black rock and around to the lake without losing a lot of altitude, but that is what I was hoping for. As I got closer and closer, it was no more clear if I would be able to make it. I went on, delicately, telling myself that I could always go back if things got too dicey. By the time I got to the base of the black rock, I was so tired I was shaky. The black stuff was fractured into sharp, slippery pieces. I slipped and cut my wrist, but I had to keep going because the footing was too insecure for me to get my pack off. I was really relieved as I rounded the corner and saw the slope lessening. I struggled up to Glacier Lake, found a little perch near the lake, and settled down to repair my wrist. 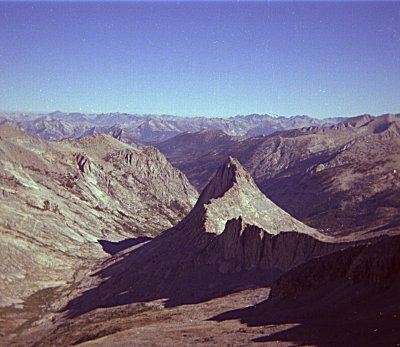 From Galcier Lake, the route to Triple Divide Pass and the north ridge was obvious. The contrast between the white granite and the darker rock was striking. 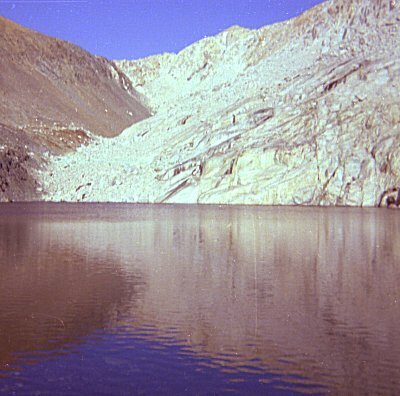 Glacier Lake is almost 12,000 feet, with almost no vegetation and with only a couple flat spots. Being so high made me feel exposed and nervous. I could not wait to get down. But first, I was determined to climb the peak. 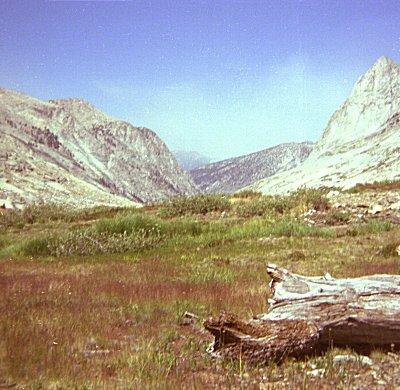 From Triple Divide Pass, I had a great view of the upper reaches of Cloud Canyon, and of the little lake at its extreme upper end. 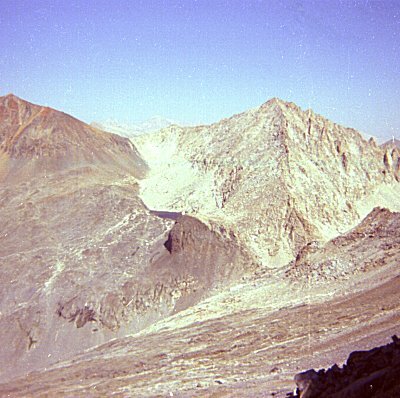 I made splendid progess up the ridge toward the peak. This, my first experience of climbing along a high ridge, was exhilirating. I felt like walking along a sidewalk suspend thousands of feet in the air. Only in the last hundred feet or so did the ridge become to steep to walk on, and I had to hold on with my hands. Before I know it, I was on the top. 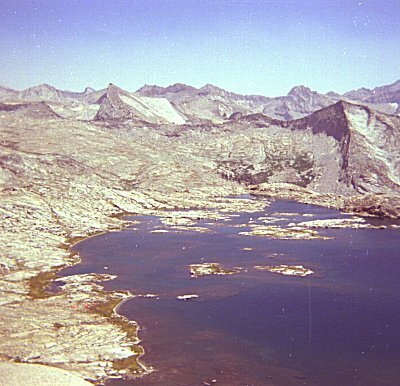 I could see, on the south, Lion Lake, with Tamrack Lake in the distance, sight of last year's adventure. 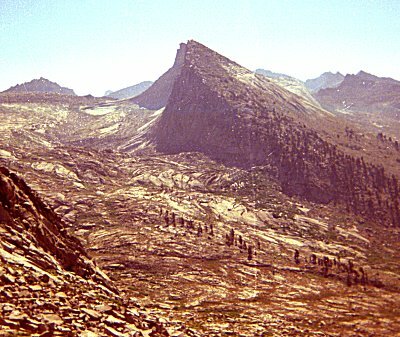 On the east I cold see the rest of Triple Divide Pass and the canyon of the Kern-Kaweah. I descended without incident, packed up my gear, and set off down Cloud Canyon for Mt. Brewer. When I reached the canyon floor, at the site of the miner's camp, I stopped for the day. I carefully studied the route I had taken, and the way I had come the day before, so if I would ever need to come this way again I could find the pass. The next day I took off down Cloud Canyon. I pushed on as fast as I could comfortably go, without stopping, until the late afternoon. As I was approaching Brewer Creek I began to smell smoke, and then I saw that the forest was on fire ! 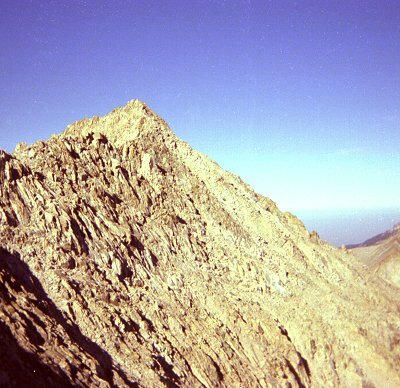 I had been planning to hike up to Moraine Ridge on the trail, and then to climb Mt. Brewer from there. But I scouted left and right, and it seemed that the whole canyon floor was burning. I could not get past it. Part of the problem was that I had no concept how fast firest fires move, or how dangerous they are. I assumed that a burning tree could/would fall at any moment, right on me. I did not know how deep the burning zone was, or whether the thick blanket of pine needles was burning underfoot. I headed up the side of the canyon, on the hope that I could get round the fire that way. I even thought I might get up to Moraine Ridge, and be safely away from the fire. But a few hundred feet up I encountered blazine manzanita bushes in my path. I was throughly disheartened. It was now about five PM, and I was growing panicky. I turned around and headed back up the canyon. I was afraid to stop lest the fire follow me and overtake me at night. I wound up hiking back up another five miles or so, until well after dark. It is amazing how far adrenalin will take you. Luckily I knew exactly how to get up to the pass. I retraced my steps through Coppermine Pass to Elizabeth Pass. Then I headed over the pass to Bearpaw, and back home on the trail.